UPDATE - TIMELINE FOR PAYMENTS ANNOUNCED! Today, the Fair Work Commission issued the final Workplace Determination on your pay and conditions. Your new terms and conditions take effect today (including your new overtime provisions). More information on this to follow. 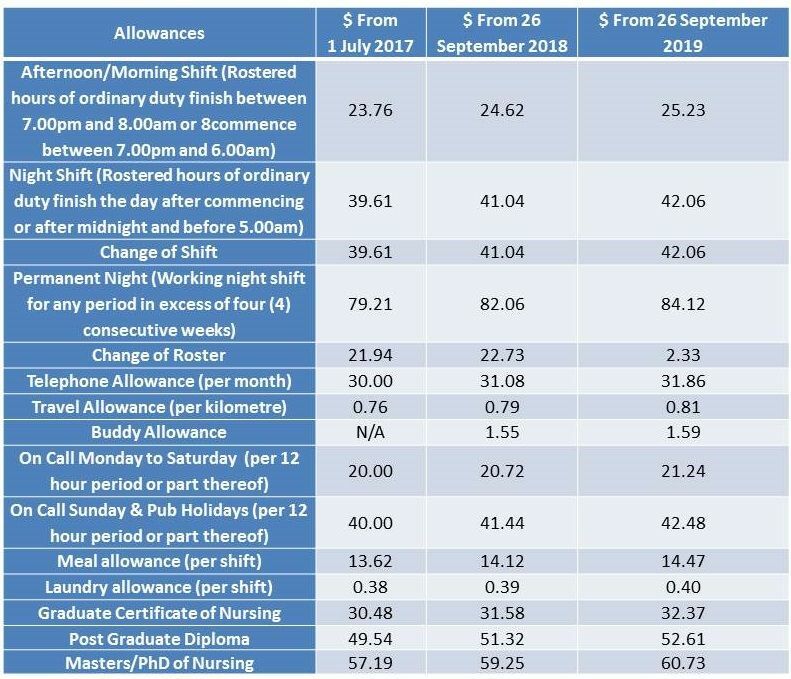 Due to Dorevitch’s clumsy payroll system, the Commission has given them until to 5 December 2018 to process the increases and back pay. The HWU opposed this delay in processing your payments. However, the Fair Work Commission accepted Dorevitch’s payroll system couldn’t cope, and have permitted the delay. This year, you won’t just get a gingerbread man for Christmas. Instead, you will receive up to a 20 per cent wage increase and back pay to July 2017 (together with up to 30 per cent increases in your allowances). Anyone employed as of 26 September 2018 is entitled to be back paid. You only get this money, because of HWU members standing together. Don’t just thank a union member, join them and stand together! To join the HWU, call us on (03) 9341 3300, return the membership form found below or by following this link. HWU DOREVITCH MEMBERS WIN BIG! On 13 September 2018, the Full Bench of the Fair Work Commission issued a decision with a draft Determination about your pay and conditions. This is a big win for all Dorevitch employees. Finally, you get a Fair Bloody Go! As you know, the fight for fairer pay and conditions has not been easy. When 89 of our Dorevitch members were locked out and all hope seemed lost, you all stuck together. You helped and supported each other, you had each other’s backs – you gave your time, energy and spirit. You showed no fear in the face of injustice. You stayed the course and showed what unionism is all about. Make no mistake, you won this. We congratulate and thank all 605 of you for your sacrifice, courage and determination. After 11 years, time was up for Dorevitch Pathology. Please read the below summary of the decision carefully. More information will follow. I am so proud to be a member of this union alongside you. The Fair Work Commission has determined wages in accordance with a formula. This formula is based on the old agreement wage rates from 2007. Depending on your classification and years’ of experience, wages will increase up to 20%. Allowances will increase up to 30 per cent. This will be back paid to July 2017. Further, from when the determination is finalised later this month (see below), there will be a further increase of approximately 3.6% in real terms. In twelve months time there will a further 2.5% increase. 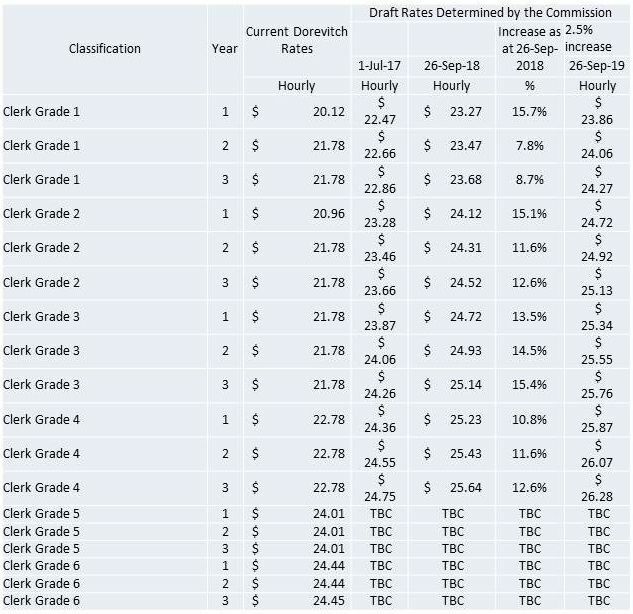 Note: The above tables are based on the draft wage table provided by the Fair Work Commission in the Draft Determination. This decision is a draft Determination. The final Determination will be issued later this month. Both the HWU and Dorevitch are allowed to make submissions to the Fair Work Commission on minor errors, typo’s, etc. Once this is complete, the Determination will be finalised. After this, you will start receiving payments. The length of this Determination is until 31 December, 2019. The Fair Work Commission has increased allowances significantly (most by up to nearly 30%, with 25% back paid to July 2017). Many allowances had not been updated since 2007. Some allowances, such as the Telephone Allowance and Buddy Allowance, are new payments that the union fought for. See the table below for the new allowance rates as they will apply from 1 July 2017 to 26 September 2019. The current sick leave provisions are maintained. Dorevitch wanted to cut your sick leave, but the Union fought to protect them. Time off in lieu will be at overtime rates. Dorevitch wanted to slash accident make up pay to 26 weeks. The HWU was successful in preserving the status quo at 39 weeks. Payment of pro-rata long service leave is at seven years if made redundant. Dorevitch wanted to remove this. We won. This has been maintained. The status quo remains for Pathology Collector classifications for Grades 1, 2 and 3. 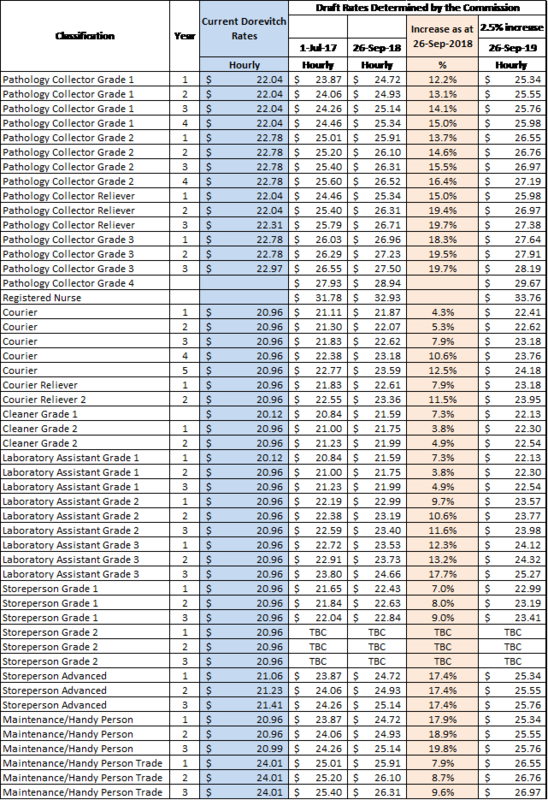 A new Grade 4 Pathology classification has been added. Additional weeks annual leave for working 4 or more hours on 10 weekends in a year. Part time employment: provisions regarding engagement of part time employees. Review of part time hours. Classification for Pathology Collector Grade 4 – creation of a new classification. Dispute resolution: process for dealing with disputes (including collective disputes), power of the Commission to arbitrate without the consent of the parties. Preserving change of shift provisions. Preserving broken shift protections and penalty payments. Redeployment considerations in a redundancy (for the most part). Partial redundancy provisions (by agreement). Rostering protections to ensure employees can have at least two consecutive days off duty in a fortnight and transitional arrangements for existing employees. Preserving a disciplinary procedure clause, including the right to be represented during the process, and ensuring warnings are only active for 12 months unless another adverse event occurs in that time. Buddy allowance: payable when an employee agrees to buddy with less experienced pathology collectors. Payment of treble time when required to work six period of duty consecutively without 24 hours off. Cashing out of annual leave arrangements. Parental leave: extending parental leave rights to all genders and families, and providing the same entitlements in cases of adoption. It’s times like this that makes you glad you voted down Dorevitch’s Dodgy Deal. You can download a copy of the decision by clicking on the attached document below. We will keep you updated with further information.